We just heard that February is “Responsible Pet Ownership Month.” Who knew? And maybe a better question is, shouldn’t every month be Responsible Pet Ownership Month? Better yet, every day! Responsible pet ownership is one the KEY elements to creating safe, humane communities. So when dog owners disregard the basic rules that govern responsible pet ownership, they don’t just cause a problem in their immediate circle, they also make it harder for every single dog owner out there. For example, calls for BSL usually stem from a single incident involving one irresponsible dog owner whose actions (or inaction) caused trouble. Being an irresponsible dog owner creates community-wide problems! That’s not to say that “pit bull” dog owners need to be more responsible than other dog owners. ALL dog owners need to be equally responsible…all the time, every day, in all kinds of ways. Responsible dog owners are aware of how their actions impact those around them. Are you responsible? Let’s take a look! Allow your dog to roam loose and unattended. 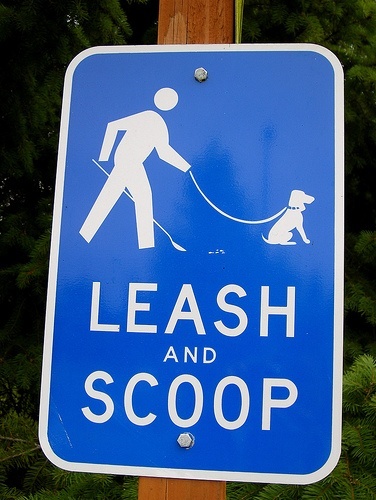 Fail to scoop your dog’s poop on public property. Allow your dog to be a nuisance to your neighbors. When you do these sort of things, it upsets everyone around you, it’s unsafe for your dog, and, frankly, it makes us all look bad. If you said yes to any of the above points, you have the potential to be a community problem with repercussions that may spread far beyond just you and your pets. Not being a community problem should be a goal to strive for every single day, not just during the month of February. Because let’s get real: we all notice the irresponsible things dog owners are doing. And we’re tired of it. Stop messing stuff up for the rest of us, will you please? For more on the humane care, custody, and control of dogs, please see NCRC. Next “Pit Bull” Dog Advocates: Is the Info You Share Hurting or Helping? I LOVE this one! Bravo. Now if I could only find a way for you to send it to some of the people on my street (and in my town) I’d have a perfect day today and everyday!